San Diego Property Management, San Diego Property Managers, San Diego Property Management Companies. Penny Realty, Inc. has been an established leader in Single Family Home Management since 1965. We recognize that your rental property is a very valuable asset. You can entrust the management of that asset to an organization with a long trusted history that offers you piece of mind. We customize our service based on the owner and property needs. Our portfolio is composed of single-family homes and multi-family dwellings up to 100 units. We guarantee we will rent your property in 14 Days or less. On average, Penny Realty rents vacant Homes and Condos in 11 days from the time they are rent ready. Please Click Here to learn about our Exclusive 5 step Marketing Plan. Not only do we rent fast, but we also rent to high quality tenants. Please see the Penny Realty exclusive 11 step Tenant Screening process. If you would like to see how we stack up against other San Diego Property Management Companies, see our Comparison Chart. Penny Realty, Inc.’s team is made up of Property Managers, Leasing Agents, Bookkeepers and Maintenance Personnel who execute the delicate management of relationships between residents and owners. We have deep experience and knowledge in adhering to the best practices in the Property Management Industry. This means you are assured of protecting the value of your real estate asset and increasing your equity and long term return on your investment. We also create a friendly environment for residents in which they enjoy over the top customer service and prompt response to their daily living needs. Penny Realty Inc. offers fee based management services. Our Corporate office is located in central San Diego, more specifically, Pacific Beach. We manage properties throughout all of San Diego County. Penny Realty, Inc. offers a consistent approach to Property Management that helps us provide the quality service that our clients require. However, we are flexible enough to fit your needs and offer customized Property Management solutions. We manage all financial aspects of owning and Rental Income property. We advertise upcoming and current vacancies daily on multiple websites as well as the San Diego Multiple Listing Service. We know how to obtain maximum exposure for your vacant rental. Our objective is to obtain the maximum amount of fair market rent in the shortest period of time possible. An up to date available property listing can be found in our lobby at all times. Our Penny Realty, Inc. signs are posted on our nearly 350 properties. It is essential to adhere to all Federal and State Fair housing Laws. Our team is well versed in Fair Housing Laws which avoids unnecessary liability to the owner. We have an extensive list of preferred vendors who offer reduced rates due to the high volume of business they receive from Penny Realty, Inc. We use only well vetted, insured vendors with a track record of success. Our attention to detail during move in and move out inspections allow the recovery of turnover costs through Security Deposit deductions. We require all residents to carry a Limited Liability Renter’s Insurance Policy that provides minimum of $100,000 in Liability Insurance. Convert occupied or vacant property into a properly appointed and priced rental home(s). Restore, remodel and repair damaged and outdated property to prepare for re-renting. Transform historically tenant troubled properties into rent reliable properties. Minimizing length of vacancies and renting at maximum rates. Lease up of brand new or repositioned building(s). Lowering operating expenses and facilitating capital improvements. Hiring, training and supervising onsite managers as well as administering payroll tax, workers comp insurance and rent credits. Conduct detailed analysis of before and after tax cash flow projections and net operating income. Guide through the transition of purchase to management. On staff we have Licensed Brokers & Agents with advanced Business degrees (MBA) and specialty Real Estate training and designations such as the Certified Commercial Investment Member (CCIM) and Certified Luxury Home Marketing Specialist (CLHMS). Hire Penny Realty and put this training and education to work for you and your property! Don’t just hire a property management company… Hire a strategic business partner that is dedicated to improving the bottom line results of your investment real estate… and take confidence in our guarantee’s to you. They represent “best in class” in the property management business! We understand that your Rental Property is your “pride and joy” and represents a substantial investment. Not only does Penny Realty take extraordinary steps to maximize your revenue and net income, but we also go above and beyond to protect your property. If we are unable to lease your Home in 14 Days or less, we will provide your first TWO months of property management free! We must set the price based on our knowledge of fair rental value. The Home or Condo must be vacant. The 14 Days start when the Home is ready and in move-in condition. The 14 Day Rental Guarantee is not offered to everyone. 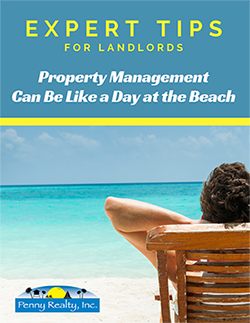 It must be part of, and written into your property management agreement. With our results guarantee you don’t pay us any money until we produce! You can look at us as your junior partner, who happens to be an expert in the property management business. We get paid when you get paid! We do all the work up front and you don’t pay us until the tenants start paying rent. We will launch a full marketing campaign, show your property, thoroughly screen the tenants, draft the lease, and perform a move-in inspection… all with no upfront fees! We do not charge a leasing fee and there is no mark-up on maintenance services. There is no charge for set-up fees, admin fees, and transfer fees. There is just one fair full service fee that starts when your tenant starts paying rent. Our “Results Guarantee” assures you that we will work hard on your behalf and provide you with positive results and peace of mind! At Penny Realty we take great pride in the selection of high quality tenants. Due to our high standards we are able to provide an “Eviction Free Guarantee”. 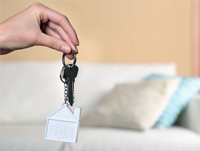 If a tenant needs to be evicted for non-payment of rent, our legal counsel will handle the eviction up to $1,200. Additionally, we will re-rent the property with zero leasing fees. We must have placed the tenant. This does not cover tenants we have taken over or inherited. This guarantee is only for eviction due to non-payment of rent. We must be the Property Manager for the entire length of tenancy. This offer does not cover the cost of the tenant attorney fees or related expenses. The Eviction Free Guarantee is not offered to everyone. It must be specifically included in your property management agreement. Recently named one of the 20 “Best of the World” destinations by National Geographic, San Diego certainly lives up to its nickname of "America’s Finest City." It is the eighth largest city in the United States and second largest in California. San Diego is known for its natural deep water harbor, its extensive, glistening beaches, its long association with the U.S. Navy, its recent emergence as the hub for top healthcare and biotechnology development and, most of all, its ideal climate. San Diego has a mild year-round climate with an average of 201 days above 70 degrees Fahrenheit and low rainfall (9 to 13 inches annually). San Diego is a city of villages, made up of numerous distinct neighborhoods, each with its own distinct personality. 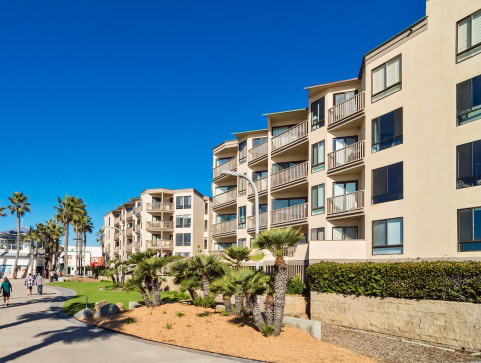 The coast is lined with beach-side communities, including the most popular beach destination in San Diego – Pacific Beach. Within downtown you’ll find several small enclaves, including Little Italy, Horton Plaza and the Gaslamp Quarter. 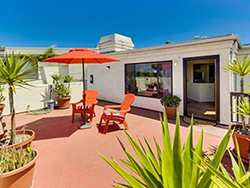 North Park, Hillcrest, Bankers Hill and Golden Hill are the neighborhoods surrounding downtown and Balboa Park.